Today Radius Networks would like to announce new versions of our beacon tools for Mac: MacBeacon 2 and ScanBeacon 3. Both of these tools now support a full range of beacon advertisements including iBeacon, AltBeacon, Eddystone UID, Eddystone EID, Eddystone TLM, and Eddystone URL (Physical Web). We have found these tools to be invaluable while developing mobile apps which respond to beacons and we’re excited to extend them to support the full line of Eddystone advertisement types. With MacBeacon 2, you can easily simulate iBeacon, AltBeacon, and Eddystone beacons. It is even possible to do interleaved advertising to broadcast multiple beacon types simultaneously. MacBeacon 2 also supports Eddystone EID. With Eddystone EID, you have the option of registering your beacon with Google’s Proximity Beacon API and adding attachments to it so that your app can receive the attachments when the beacon is detected. Before getting started, you may need to create a new Google project using the Google Developer Console. In order to register, you must first fill in all the fields with valid values including the “Identity Key” field which will be computed during the registration process (you can initially enter all zeros for this). After you have filled everything in, you must check the “Enabled” checkbox in order for the “Register” button to appear. When you click “Register”, you must authorize MacBeacon so that it can register beacons into your project on your behalf. Then you must select your project from the list. 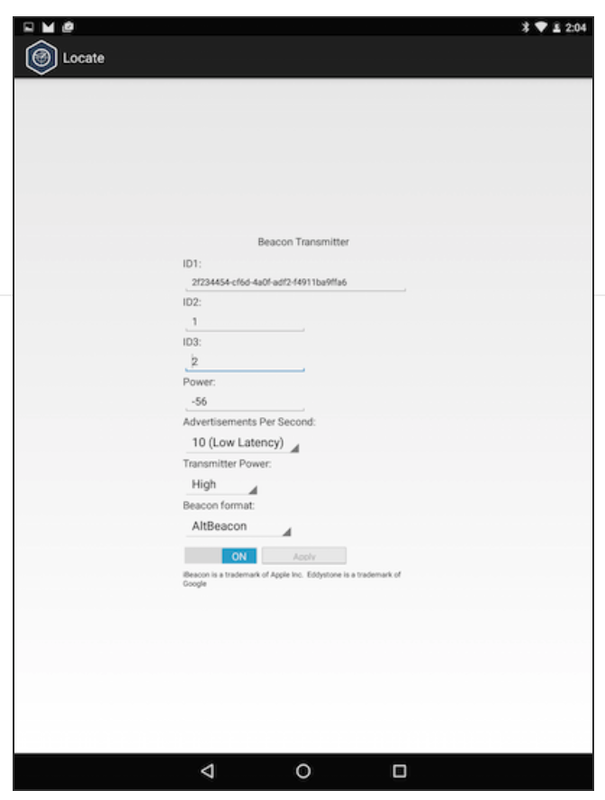 If registration is successful, MacBeacon will enable advertising and you should see some “advertising information” (including your registered beacon’s name) display below the form. One thing to note: the “Namespace” and “Instance” combination must be globally unique. if you attempt to register an EID using a Namespace and Instance combo that is already registered, Google’s API will return a “409” error indicating that there is a conflict. In addition to supporting Eddystone, ScanBeacon 3 also allows more advanced filtering of the advertisements that appear in the list. You can select which beacon types you want to include via the “Beacon Types” drop-down menu. The search field has become much more powerful and allows you do do a “full text search” on your list of beacons. For example, you can search for all Eddystone advertisements by entering “eddystone” or all Eddystone URL advertisements by typing in “url”. You could enter “uid 2f23” to find all Eddystone UID advertisements with “2F23” in either the namespace or instance identifiers. You also have the ability to look at the advertisement bytes via the “Inspect Bytes” (CMD-I) command. If you plan to use both MacBeacon and ScanBeacon on the same computer, you should know that ScanBeacon cannot see beacons that you broadcast using MacBeacon because they will both use the same bluetooth chip in your computer. Hope these tools help you build something cool. When you do, we’d love to hear about it. We are excited to announce the newest product from Radius Networks, Physical Web Display for Chrome OS. Physical Web Display is a Chrome Kiosk app that combines the advertising and marketing power of digital signage with the user enhancement and engagement of the Physical Web. With this app, you can easily set up an array of custom digital signage displays that not only show content to potential users or customers visually, but also connect with them directly via their mobile devices with the Physical Web. So what makes this different from every other digital signage app out there? Can’t you just use a QR code to share a URL and let people access it easily on their phones? Or maybe an NFC tag? Well QR codes are great and all, but literally no one has ever scanned one to open a URL. Physical Web is like a QR code that people will actually use. URLs are pushed over-the-air to a user’s phone automatically, so they can check out your site without having to be the one guy that scans a QR code while everyone else around silently judges them. NFC tags are a little better, but they require you to slap one on or around every display you have out there. The Physical Web Display app uses the internal Bluetooth capability of the Chrome OS device to transmit the URL, so everything works out of the box without additional effort. How can this help your business or organization reach users or customers? Rather than just asking them to check out your website or download your app, you can link them directly to your homepage, webstore, Facebook page, or Twitter feed. You can broadcast the URL to download your app in the App Store or Google Play Store directly, all without the aforementioned clunkiness of QR codes, NFC tags, or manually entering URLs. With deep linking in mobile apps, you can even send users to a specific location inside your app. The app works by letting you provide custom content to display on-screen, which is then paired with a custom URL that you provide. This URL is transmitted over Bluetooth using Google’s Eddystone URL standard (the backbone of the Physical Web) while the paired content is displayed, reaching nearby users and allowing them to easily access the URL. You can add as many of these content/URL pairs as you want, and configure how long each one is displayed before rotating to the next one in the queue. The Physical Web Display app runs on any Chrome OS device, from the small yet powerful ASUS Chromebit to the all-in-one AOPEN Chromebase, both of which are perfect for digital signage. To get started, find the right Chrome OS device for your needs and head to our knowledgebase for instructions on installing the app on your device and configuring your first advertisement. You can also check out Physical Web Display in the Chrome Web Store. For more info about the Physical Web and its possibilities check out our blog post and the Physical Web site. Calculating the closest beacon to a device can be a challenge, but our latest release of ProximityKit makes it very easy to do. We’ve added a new delegate callback method to our library that will tell you when the closest beacon has changed. It’s easy to use right out of the box and it can be configured as needed. Let’s look at how we solved the challenge so you can focus on writing world-class applications. If you read through Apple’s iBeacon documentation, you’ll find their recommended approach to distance ranging is to use the proximity property on the CLBeacon class and they discourage developers from trying to detect specific distances. While this is a very good strategy, there are times when it is appropriate to determine the beacon’s distance. These values are calculated by Core Location automatically and take into account factors such as RF signal interference, fluctuation, etc. Note: In our ProximityKit iOS library, we expose the proximity and accuracy properties from Core Location’s CLBeacon class in our RPKBeacon class. Any tips you find around the web for working with CLBeacon also apply to our RPKBeacon implementation. When is estimated proximity good enough? For many use cases, knowing if a device is immediate, near, or far from a beacon is good enough. Ideally, beacons are physically placed far enough apart so that it is not possible to be in immediate or near proximity of two beacons at the same time. If this is the case for your application, the code can simply use the didRangeBeacons:inRegion:callback from ProximityKit or Core Location to see which beacons, if any, are immediate or near. In practice, the immediate proximity is approximately 1-2 meters from the beacon, and this might be too close for your needs. You probably don’t want users to crowd around a podium in the middle of a museum exhibit to trigger an immediate proximity event. In this scenario, it would make more sense to trigger when the proximity is near, but what if two beacons are both reporting near at the same time because they are about ten meters apart? ProximityKit (and Core Location) also returns an accuracy measurement derived from a calculation using the beacon’s signal strength (RSSI) and the measured power calibration. While it is not strictly a distance measurement, it can be used as a proxy for distance calculations. Apple recommends this property be used “to differentiate between beacons with the same proximity value”. Let’s imagine a scenario where three beacons are placed in a room approximately fifteen meters apart. Your user is standing in the room and all three beacons are reporting a proximity of near. We want to tell the user which beacon is the closest, so we can differentiate the three beacons by looking at the accuracy property. The challenge of using the accuracy property is that the value can fluctuate wildly in a short amount of time. Perhaps the room is busy and people are walking between the device and the beacon, causing the signal to fluctuate and sporadically disappear. To combat this, we can create some logic that averages the readings over a few seconds and reports back a running average of the accuracy reading. The logic is straightforward, but there are subtle details that must be taken into consideration to conserve battery life and processing. We wrote it so you don’t have to! We felt this was enough of a common use case that we should write an implementation for the developers using our beacons and ProximityKit library. This functionality has been released with version 1.2.1 of our ProximityKit framework. Note: averaging_seconds has a default threshold of five seconds; you can omit the key/value in the configuration if that value works for you. If you go out of range of all beacons, the beacon value will be nil. Steps #2 and #3 are designed to prevent “flapping” behavior where two beacons in very close proximity keep fighting each other to become the closest. This is part of the ‘smoothing’ behavior discussed above. We hope that this new functionality cuts down the amount of code you need to write as a developer when you need to calculate the closest beacon. Give it a shot, and let us know what you think! Radius Networks today announced the next step forward in promoting and popularizing the Physical Web by enabling customers to order RadBeacon proximity beacons that customers can purchase pre-configured to advertise Google’s Physical Web protocol. Pre-configured Eddystone URL beacons are available for purchase on the company’s website and simplifies deployment and access to the Physical Web, the latest advancement of the Internet of Things. The Physical Web combines the power of web technology with the explosive growth of the Internet of Things, giving any smart device a web address. Soon, thanks to the power of the Physical Web, walking up to any smart device, be it a rental car, vending machine, a child’s toy, or a city bus stop, will provide immediate access to useful and relevant information and services. At CES 2016 in Las Vegas, Radius Networks deployed 1500 beacons throughout the convention show floor to deliver indoor navigation, in-app messaging and gamification to attendees via the CES Mobile App. The beacons also broadcast Physical Web URLs that, when clicked, took attendees directly into the maps section of the CES app. If the attendee did not have the mobile app, they were taken to a web page where they could download it. 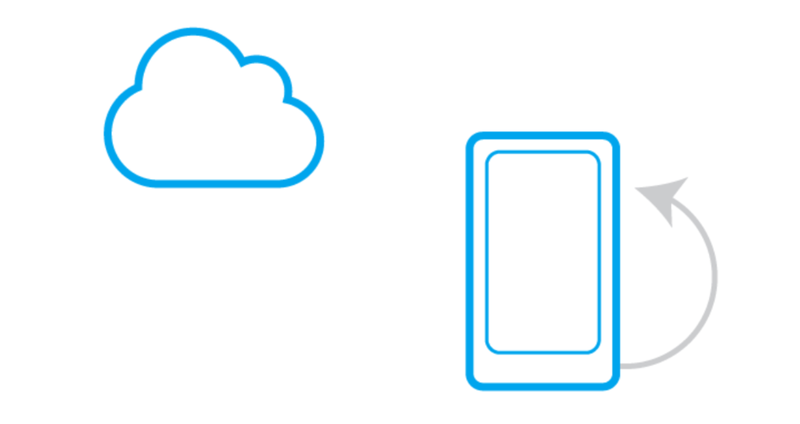 Get started today with Physical Web Beacons. They are available on our store now. The folks over at Make Magazine have posted about their efforts to hack the CES 2016 Beacon Scavenger Hunt. Hey Alasdair and Sandeep, Marc Wallace at Radius Networks here. The purpose of the Scavenger Hunt is to encourage attendees to explore areas of the show floor that they might otherwise have missed. If you complete the scavenger hunt, you get a token that you can present at the CES office and win a prize. For the top prize winners, we use a procedure to validate that they actually visited the scavenger hunt locations at CES. Simulating the beacons at your desk generates a token in the mobile app, but it doesn’t mean you completed the scavenger hunt. It just means you missed out on seeing some really cool stuff at CES. Radius Networks and CTA take mobile privacy very seriously. Beacons are used to generate venue foot traffic analytics which do not contain personally identifiable information. Also, the message that was pictured and described as creepy, and possibly as a result of tracking using beacons, has nothing to do with our beacon implementation. In addition to scavenger hunt beacon information, you also accessed indoor navigation beacon definitions with related lat-long information. These beacons are in support of our extremely successful indoor navigation implementation at CES. As with the scavenger hunt beacons, this information is not considered sensitive, and the identifiers are essentially public information. As a general approach, it’s important to use the appropriate security mechanisms for the sensitivity of the information involved. We feel we accomplished this for CES, that the integrity of the Scavenger Hunt has been maintained, and that attendees at CES will continue to enjoy the benefits of the beacon network. 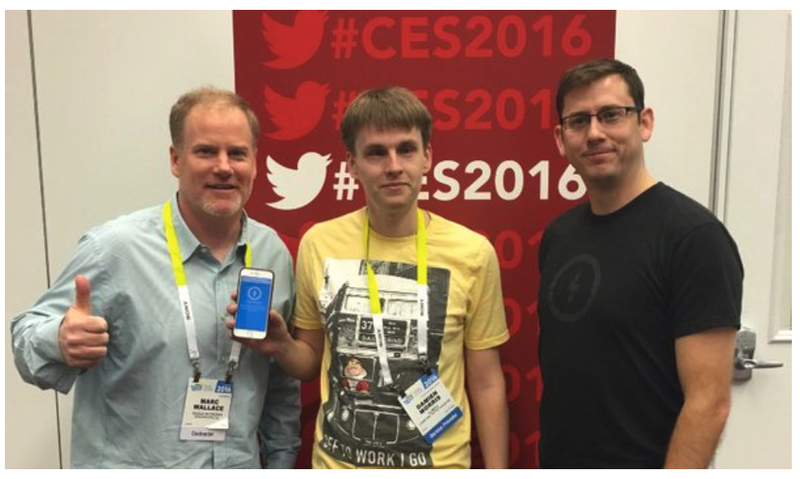 Marc and Chris with the CES 2016 Scavenger Hunt Grand Prize Winner, Damien. Join us and check out the latest in beacon technology from Radius Networks and Google. See amazing demos and what we can expect in 2016. We’ll have lots of refreshments available. What better way to wrap up your first full day at CES 2016! RSVP Now. Space is limited, so RSVP is a must. Sign up now to reserve your spot on the guest list! While most beacon apps focus on detection of bluetooth beacons, some of the coolest mobile apps you can make involve making the device transmit as a beacon as well. Think about an app that lets friends know they are nearby one another. When two users walk within about 50 meters of each other, presto! The app alerts you that a friend is nearby. Apple has supported beacon transmission since iOS 6, and most Android devices have done the same starting with Android 5.0. But lots of folks are wary of transmitting all the time. The conventional wisdom is that app developers need to be careful about transmitting because of its impact on battery. We all know that angry users with drained batteries will quickly uninstall your app. Is transmitting as a beacon really that bad? To test this hypothesis, I used the Locate app for iOS and Android, the first configured to transmit an iBeacon frame and the second configured to transmit an AltBeacon frame. I figured I could run the apps for a long time and see what the battery drain is compared to the same device over the same period of time without the transmitter app running. It is important to note a major difference between iOS and Android when it comes to transmitting when your app is in the Background. On iOS, you essentially can’t do it. While BLE advertisements are allowed in the background, they are only allowed using a proprietary Apple format intended for advertising application services. You can’t send standard iBeacon transmissions unless your app is in the foreground. Android, on the other hand, has no such restrictions — you can transmit in the background all you want. The fact that you aren’t allowed to transmit in the background on iOS leads many to believe the restriction is in order to save battery. Apple is notoriously stingy about restricting background usage of operations that are battery hungry. Because of this restriction, the Apple tests had to be run when the app was in the foreground and the screen was on. Obviously, the screen causes a big battery drain itself. So it was important to run both the baseline test and the transmitter test under the same conditions with the same screen pattern on. In order to test the battery usage of beacon transmitters on iOS and Android I installed the Locate app on an iPod Touch 5th Generation with iOS 8.1 and a Nexus 9 with Android 6.0. I chose non-phone variants of iOS and Android so I could eliminate the cell radio as a source of battery drain — something that is often outside developer control and subject to random variation. In addition, during the tests I put the devices into airplane mode (but with Bluetooth enabled) so that WiFi and GPS radios did not affect the results. Finally, I uninstalled everything but stock apps so I knew there weren’t any other apps draining the devices in the background. Because iOS can only transmit in the foreground, I configured “AutoLock” to Never and set the screen brightness to a minimum. This kept the screen on and the app in the foreground. For both the baseline and transmitter tests, I kept the same Locate transmitter screen on the display. This is important because different screen patterns can affect battery usage when the display is on. The first thing you notice is that the Nexus 9 really does not use much of its battery regardless of whether it is transmitting or not. And even with the beacon transmitter on, the battery was still at 100% after nearly 24 hours. After over two days of transmitting it was still at 94%. Clearly that beacon transmission is not using much battery. It’s so low, it is impossible to calculate how much it is using with any certainty with this test setup. The iOS results show much higher battery usage 36% over the course of only four hours, but it is undoubtedly due to the screen being on. In fact, when both the screen and the beacon were on the battery usage was lower. There is no reason to think this is actually because the beacon transmission saves battery — it’s probably just that the beacon battery usage was within the margin of error of the test method. Because the screen is using so much battery, it’s hard to conclude that the beacon transmitter battery usage is negligible in this test setup. However, it is clearly negligible compared with the battery usage of the screen. And since iOS requires the screen to be on to transmit a beacon signal, there is no point in worrying about beacon battery usage at all. These tests show conclusively that beacon transmission on iOS and Android causes an insignificant battery draw compared with other sources of battery drain. There is simply no reason to avoid beacon transmission in order to save battery. Is this really so surprising? Consider that manufacturers of hardware beacons typically power a transmitter for months using a tiny CR2032 coin cell battery. These batteries have a capacity that is less than a tenth of the energy density of even the small battery in an iPod touch. The fact that Apple restricts transmission in the background probably has more to do with other design concerns (like limitations on how many apps can transmit full advertisements simultaneously using a single bluetooth chip.) So if you have an app on an Android device that can transmit in the background, and you can get access to the transmitter before all the transmission slots run out, go for it! Your app users will never notice the difference in battery usage. 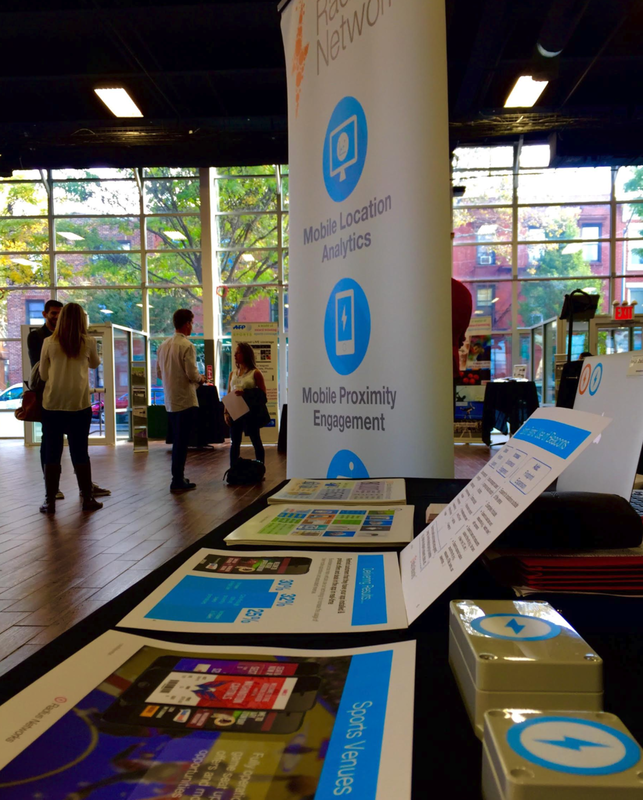 Radius Networks is at the Hashtag Sports Fest today and tomorrow in Brooklyn, NY. Hashtag Sports Fest is a groundbreaking 3-day expo, conference, and celebration of the convergence of sports, digital media, and technology that will serve as an industry showcase and catalyst for innovation. Over 30 exhibitors and hundreds of decision makers from global brands, media companies, and disruptive startups will gather with the sports industry in over 60,000 sq. ft. of New York City space on Oct. 20-22 to discuss the critical opportunities and challenges that emerging technologies present to sports content providers and the Millennial / Generation Z fan experience. From the creators of the industry leading #SportsConf virtual thought leadership series with over 125 speakers and 20,000 viewers to date, the inaugural Hashtag Sports Fest will take the conversation offline for an unmatched, immersive educational experience and networking opportunity in the heart of Brooklyn. Come see Radius Networks and a lot more innovations, where sports and technology meet to make marketing and fan experiences better. For more details and to visit the free expo check out hashtagsportsfest.com. PassKit was introduced in iOS 6 and brought us coupons, boarding passes, store cards, and event tickets directly on our iPhones. I remember adding an Alaska Air boarding pass to Passbook several years ago (now known as “Wallet” in iOS 9) and being pleasantly surprised to see it magically available on my phone’s lock screen when I was at the airport. I’m guessing they used a geofence in the pass to cause it to be front-and-center when I was at the airport where I’d board the plane. It turns out you can do the same thing when a pass is installed on a device that is in proximity to a specific beacon! Different types of passes can be added to Wallet: airplane boarding passes, store cards, discount coupons, and payment methods for Apple Pay, just to name a few. In this tutorial, we are going to build a membership card pass for a fictional fitness club named “RadBeacon Athletic Club”. The idea is that the pass should pop onto the iOS lock screen when in the vicinity of a beacon at the facility’s front desk in order to be scanned. The RadBeacon Athletic Club (RBAC) has a front desk where members check in as they enter the fitness area. We would like for the member‘s pass to be available from his phone‘s lock screen when he arrives at the front desk. This will make it very easy for the member to have his pass scanned without even breaking stride. For the purpose of creating a pass, I will pose as member #24601. There are additional images that may be specified for a pass, but we‘re keeping it simple. The pass.json file is where the magic happens. It is simply a dictionary of keys and values that define the pass. There are a bunch of different keys available, including pass identifiers, description, styling, and “relevance” which specifies where the pass is likely to be used. The beacons key is the one we’re interested in. I started with the “generic” pass sample provided by Apple and stripped it down to the bare minimum and then added the beacons entry. "relevantText" : "RadBeacon Athletic Club Front Desk"
Once you‘ve assembled the contents of your pass, you need to sign the pass directory with a certificate obtained from the Apple Developer Member Center. This generates a .pkpasspackage which is the actual pass that needs to be distributed. I used the Apple-provided signpass executable (see Passbook Support Materials) in conjunction with my certificate to generate the signed pass package. These steps are all covered in detail at the Apple Developer site. The completed pass directory can be found here. After signing the pass, I previewed the pass on OS X. Because iCloud is configured on my Mac and on my iPhone, I am able to add the pass to my wallet directly from my Mac by double-clicking the pass and clicking Add to Wallet. You can send the pass to your phone any way you like — email, Message, AirDrop, web site — as long as you can tap on the attached pass to install it into Wallet. Note that Location Services need to be enabled for the Wallet app on iOS in order for the pass to become available in the vicinity of a beacon. I used RadBeacon to configure a RadBeacon Dot with the UUID, major, and minor specified for the front desk. Once the pass is installed and the beacon is enabled, whenever my phone is in the vicinity of the front desk beacon, the pass becomes available on my lock screen. Now I can swipe on the pass notification and see the pass. The pass notification also appears on my Apple Watch. Tapping through on the notification displays the pass details and QR code. Time to go setup the TRX and feel the burn! Is Your Beacon App Ready for Android 6.0? The new Android 6.0 release has several important changes that affect apps detecting bluetooth beacons. If you have a beacon-based app already in the Play Store, or are planning a new beacon-based app, you’ll need to make updates to keep your app from breaking as users transition to Android 6.0. While this article focusses largely on the impact for users of the Android Beacon Library and Radius Networks’ ProximityKit and CampaignKit libraries that are built upon it, the same issues described here apply to any app that detects beacons. If you are using a different vendor’s SDK, it is important to make sure they will continue to work on Android 6.0. The biggest change for beacon apps in Android 6.0, codenamed Marshmallow, and sometimes called just “M”, has to do with permissions. Just like iOS, Android now implements permissions at runtime instead of the traditional way of granting permissions at install time. Apps designed for Marshmallow (SDK 23 and above) must add code to prompt users for some permissions after the app starts up, otherwise they will not be granted. Not all permissions, however, work this way. Permissions marked as PERMISSION_NORMAL are still granted the old fashioned way: at install time. For beacon apps, two important permissions continue to follow the old model: android.permission.BLUETOOTH and android.permission.BLUETOOTH_ADMIN, both of which is needed to scan for beacons. Because these permissions still use the old behavior, nothing really changes with them in Marshmallow. While the bluetooth permissions are enough to allow your legacy app to scan for beacons on Android 6.0, these permissions only allow it to do so in the foreground. Background scanning for bluetooth devices in Android 6.0, including beacons, now requires either android.permission.ACCESS_FINE_LOCATION or android.permission.ACCESS_COARSE_LOCATION. This means that apps to be installed on Android 6.0 devices that want to discover beacons in the background must make changes. Apps must declare one of these location permissions in AndroidManifest.xml. This is true even for legacy apps that don’t target SDK 23 used for Android Marshmallow. The code above will first check to see if the location permission has already been granted. If not, it will prompt the user with an AlertDialog, “Please grant location access so this app can detect beacons.” This dialog is not strictly required, but it is recommended to first explain to the user why your app needs the permission. While this message is just an example, you should probably fine tune the verbiage to explain in less technical terms what functional benefit users gets from granting this permission. Otherwise, users will likely deny the permission to keep the app from tracking them. After presenting this dialog, the system then calls the new Android requestPermissions method that actually does the prompting. The dialog screenshot above shows what the user actually sees. Android also provides a callback to the app telling you the result of what the user decided (see the onRequestPermissionResult callback), but it is important to note that users can change their mind later on via settings and turn permissions on or off. In that case, the callback method won’t get notified. It is important to note that the location permission does not replace the need to request BLUETOOTH and BLUETOOTH_ADMIN permissions – all three are now necessary. And just because you get user to grant the permission doesn’t automatically turn bluetooth on. It still needs to be turned on separately, so you will need to keep prompting your users to do that, too. Two other supplemental permissions used by the Android Beacon Library, android.permission.RECEIVE_BOOT_COMPLETED (used to start looking for beacons after phone startup) and android.permission.INTERNET (used to download an updated database of device-specific distance estimation formulas) also follow the old model. For beacon apps using the Android Beacon Library, these two supplemental permissions will continue working the same way with Android Marshmallow. The other big change for beacon apps with Android Marshmallow is that it implements two power saving modes which affect background operations. Fortunately, apps using the Android Beacon Library, and other Radius Networks SDKs built upon it (like ProximityKit and CampaignKit) don’t need to make any changes to their apps as the library handles all the details of keeping beacon scanning going in the background. If you use other code to scan for beacons, or if you are interested in how the Android Beacon Library handles the changes, read on. If you’d rather just take our word for it, skip to the MAC address section below. Android’s new Doze feature will put your device in a battery saving mode when the screen is off and it is not plugged in, and the operating system detects that it is sitting motionless based on accelerometer input. This is intended to cover cases where it is sitting on a desk, but not when it is in your pocket or purse while you are moving around, or in a moving vehicle. To understand how this affects background beacon scanning with the Android Beacon Library, it is important to understand how the library handles periodic background scanning. It uses a background Service that uses the Android Handler mechanism to periodically start and stop scanning. It also uses the AlarmManager to restart the scanning service if the app and service are terminated due to low-memory conditions or due to the user closing the app from the task switcher. Doze does not affect the ability to do bluetooth scans or run Handler-based timers, but it does affect the ability to use the Android AlarmManager system, which some beacon-based systems use to schedule bluetooth scans. For apps based on the Android Beacon Library, the disabling of Alarms does not cause problems in scanning for beacons because it only uses Alarms as a backup should Handler-based timers fail. Tests on a Nexus 9 running the third preview release of Android M (build number MPA44l) show that beacon detection continues normally under Doze. App Standby is similar to Doze, but it is triggered under different conditions. If a user doesn’t explicitly launch an app for several hours or several days (Google won’t say specifically how long it takes), the app is put into App Standby mode whenever the device is not connected to a charger. (App Standby also may be avoided if the app sends visible notifications.) Once an App is in App Standby, it generally cannot access the network, something that might prevent calling web services based on beacon detections. That said, App Standby does not specifically affect beacon detection with the Android Beacon Library, because bluetooth scanning service continues to run normally, and the AlarmManager and Handler-based timers continue to work. Again, this has been verified by tests on a Nexus 9 running the third preview release of Android M.
Fortunately, there are two other ways an app in AppStandby can get network access aside from the squishy “around once per day” promise. The app receives a new “high priority” message from Google Cloud Messaging (GCM). Receiving such a push notification amounts to a get out of jail free card. But Google has yet to release details on how to send this new high priority push notification. What’s more, it’s based on Google Play Services, which are not available on many devices like Amazon’s Kindle Fire line, the vast majority of tablets and handsets in China, and a growing number of non-Google Android devices in India and other parts of the world. The phone is charging. Any app that has been put into App Standby temporarily regains network access after charging is connected. An app can therefore register to receive a broadcast message when power is connected and then attempt to make network calls at that time. (It’s probably a good idea to delay for a minute or so to wait for full network access to be restored.) The code below shows how you set this up in the AndroidManifest.xml. While the Android Beacon Library does not require background network access, Radius Networks’ ProximityKit and CampaignKit libraries for Android do make periodic network calls to sync new data with the server. Using techniques like described above, new releases of these libraries for Android 6.0 will continue to sync data even in the background. The Android Beacon Library’s scanning service starts up in the background by using a broadcast receiver that listens for the RECEIVE_BOOT_COMPLETED event. This same broadcast receiver also handles alarms that go off after five minutes of the scanning service not being active. These alarms ensure that the service is able to keep looking for beacons even if the operating system had to temporarily evict the app due to a low memory condition. Based on testing with the Nexus 9 and the Android Marshmallow preview release, these capabilities are all unchanged with the new OS update. As described above, the only limitation with Doze is using Alarms to restart beacon scanning. Because Alarms are disabled in Doze, the Android Beacon Library cannot use Alarms to restart itself if it is manually killed by a user or if memory pressure causes the operating system to terminate the app. However, because interacting with the device will cause it to exit Doze, there is no easy way for a user to kill an app while it is in Doze. Similarly, because a user is not interacting with a device while it is in Doze, it is very unlikely that an app will start using a large amount of memory causing the a beacon-based app to be shut down to free up memory. In the very unlikely event that this does happen, the app would stop scanning for beacons until the next time power is connected or the phone rebooted. The table below shows the effect of different Marshmallow modes on the scanning and auto-restart techniques used by the Android Beacon Library. Apps on Android 6.0 can no longer read the device’s own bluetooth MAC address, and this bluetooth MAC address is spoofed when sending out packets while doing an active bluetooth scan. The MAC address is randomized each time you start transmitting as a beacon (or doing bluetooth advertising for other purposes.) While transmitting as a beacon using the Android Beacon Library’s BeaconTransmitter class continues to work normally, receiving devices will see that it sends a different spoofed MAC address each time transmission starts. While there are big changes in Android Marshmallow that affect beacon apps, users of Radius Networks SDKs like the Android Beacon Library, ProximityKit and CampaignKit are well positioned to make a smooth transition. The libraries already handle most of the details. If you have an existing beacon app that does not yet target SDK 23 and only needs to work in the foreground, no changes are needed. If you have a beacon app that needs to work in the background, you need to update it to request proper location permissions as described in the first section. Users of ProximityKit and CampaignKit will need to upgrade their SDKs to keep background syncs happening on Android 6.0. Today we have released RadBeacon Smart, the industry’s first software beacon platform. The RadBeacon Smart software beacon platform by Radius Networks can turn existing hardware with BLE capability into a beacon. The RadBeacon Smart enabled beacon can also be remotely managed and configured using the RadBeacon Smart API and through Radius Networks Director beacon management service. Additionally, the RadBeacon Smart beacon can manage other beacons within range of it, acting as a hub within a fully-managed beacon network. Radius Networks is currently deploying the RadBeacon Smart platform globally and with enterprise customers. Companies interested in learning more about the RadBeacon Smart platform can contact Radius Networks sales engineers for more information. Radius Networks, Inc., the leading provider of mobile proximity beacons and services, today released support for the Eddystone platform, the open beacon format from Google. Eddystone is an open, scalable BLE beacon format for quickly deploying real-world location context for apps. Eddystone supports several formats appropriate for different use cases, including “Eddystone-UID” and “Eddystone-URL,” which succeeds UriBeacon. Radius Networks builds beacons and tools supporting both of these formats in addition to the “Eddystone-TLM” frame that gives extra telemetry data. Radius Networks has been working with Google to include Eddystone, the new open beacon format from Google, and is providing support across its industry-leading beacons, software and services. 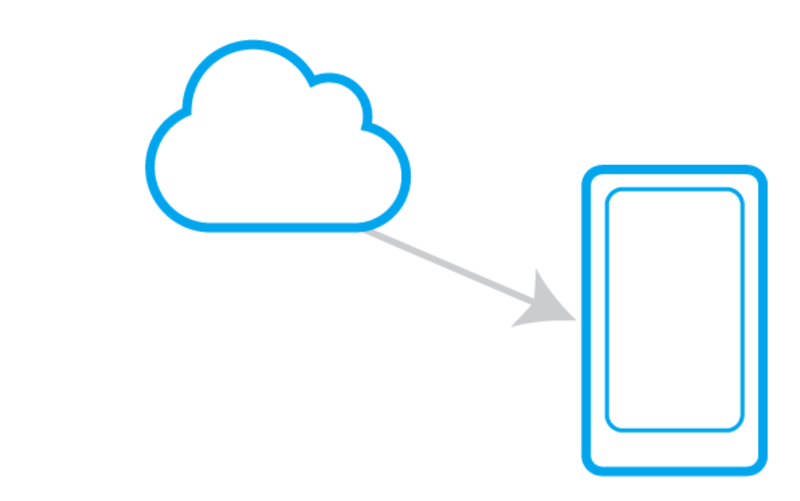 Developers can purchase development beacon kits directly from the Radius Networks Store. Radius Networks’ Android Beacon Library and Beacon Locate app have been updated to support the new beacon formats, and its Campaign Kit and Director devices are also compatible with the new beacons. With Eddystone™, the new beacon format from Google, developers making beacon-enabled apps now have more options than ever. If you’re looking to build a new beacon-enabled app, or if you already have beacon apps, it’s important to understand what Eddystone can do. Eddystone has significant differences from the other major standards. The first Bluetooth LE beacon type to gain popularity was the Apple-proprietary iBeacon™ standard starting in late 2013. It has since been joined by the open-source AltBeacon standard and the various, closed proprietary systems. Now Eddystone adds yet another open source standard to the mix. Since all of these beacon types are based on Bluetooth LE, they all have a similar radio range of up to 50 meters. Where they start to differ is in how you use them. All of these beacon types work on iOS, but Apple provides no official support for iBeacon on the Android platform. The AltBeacon standard adds that official support through a beacon standard that is open source and cross-platform. The new Eddystone standard doesn’t provide the same iBeacon interoperability, because the identifier layout of Eddystone is incompatible with the iBeacon standard. Where both iBeacon and AltBeacon use a three-part identifier that totals 20 bytes, Eddystone uses a two-part identifier totalling only 16 bytes. This can make it tricky to use Eddystone alongside existing or new iBeacon-based systems. This decision, however, allows Google to put some innovative capabilities into Eddystone. Eddystone supports the concept of telemetry, a special type of beacon transmission that contains metadata about how the beacon is operating. This includes both battery level and temperature. Eddystone also supports the multi-beacon concept. This means that a single hardware beacon sends out multiple transmissions that can be used independently. The telemetry packet transmission, separate from the main identifier packet, is one example of this. While Google is not the first company to invent multi-beacons (Radius Networks developed an iBeacon/AltBeacon interleaving model over a year ago), it is the first one to combine multi-beacons into a single standard. Eddystone-UID. This is the main transmission and consists of a two part identifier (10 bytes for the namespace and 6 bytes for the instance) as well as a one-byte transmitter power calibration value, which is used for distance estimates. Eddystone-URL. This is an alternative transmission to the Eddystone-UID that sends out a compressed 17 byte URL instead of a numeric identifier. The idea is that an app detecting the beacon can go directly to this URL without the app having to convert a beacon numeric identifier to destination web address. This Eddystone frame is the new replacement for the existing URI Beacon, an open standard also sponsored by Google. In addition to the above, Eddystone actually uses a fourth frame, which is a standard iBeacon frame. The primary purpose of this frame is so Eddystone can leverage the iBeacon standard’s special ability to wake up iOS apps in the background, at which time they can start consuming the three frames above. That said, there’s nothing stopping you from using the iBeacon frame for your own purposes. Not all of these frames have to be used at the same time. In fact, beacons based on Eddystone can be configured to turn off some of these frames to save battery power or reduce noise. The first choice you probably want to make is whether you want to use the Eddystone-URL capability. The main advantage of Eddystone-URL is that it allows you to build your app and then have completely different people deploy beacons that send your app to specific URLs. If this capability matches your use case, then it is a good choice. For more general beacon use cases you probably want to stick to Eddystone-UID. With that decision out of the way, you can decide whether you want to use telemetry. Eddystone-TLM typically isn’t transmitted as often as the other frames—about once per second. It therefore has less of an impact on battery and radio noise. If you know you won’t be using telemetry, you can always disable it. Eddystone has a two part identifier that consists of a 10 byte namespace identifier and a 6 byte instance identifier. You typically use the namespace ID to signify your company or organization, so you know when a beacon is yours. You can generate a namespace identifier with a UUID generator. But because standard UUIDs are 16 byte identifiers and namespace identifiers are only 10 bytes, you drop the middle six bytes from the UUID. This technique is especially useful if you already have an iBeacon Proximity UUID assigned for your company or organization, allowing you to use an equivalent organizational identifier for both formats. Below is an example of such a conversion. Google also prescribes a second technique for generating a UID out of a URL. So you can algorithmically convert a domain name you own like http://www.radiusnetworks.com into a unique namespace id. Because this technique uses a one way hashing algorithm, there is no way to convert the namespace id back to a URL. You can use tools like RadBeacon Android to generate namespace identifiers from both URLs and UUIDs, and configure the field directly into the beacon. The instance identifier is meant to uniquely identify a specific beacon. You usually will want to put a serial number in each one of these. If you have two beacons, you can give the first one an instance id of 1, and the second one an instance id of 2. Because the field is 6 bytes long (48 bits), there are 248 = 281 trillion combinations. That’s a lot of beacons. For the purposes of this example, we will assume that the beacon is using a namespace ID of 0x2f234454f4911ba9ffa6 (the Radius Networks default) and an instance id of 1. These are the same identifiers that are pre-configure into the Beacons with ship with Eddystone support. If you want to get started with Eddystone, you can buy a developer kit that includes hardware beacons from our Radius Networks store. These beacons can be configured with our free Android RadBeacon config app, which allows you to set the identifiers and URL (in case you are using Eddystone-URL) and set transmitter power and other options. To learn more details about how you can build an app with Eddystone, see our companion post Building Apps With Eddystone. Visit us here to access to more Radius Networks products that support Eddystone. With Eddystone™, the new beacon format from Google, developers have more options than ever in buidling beacon applications. To understand the basics of working with Eddystone, it’s useful to show the process of putting together an app. If you are new to Eddystone, check out our companion blog post, Introducing Eddystone. This example will focus on making an Android app using the Android Beacon Library, which fully supports Eddystone. If you want to try this yourself, you’ll need an Android device with 4.3+ and a computer with an Android Studio development environment. Of course, if you actually want the app to respond to beacons, you’ll need a beacon that supports Eddystone, too. To begin, create a new project in Android Studio, selecting the “Blank Activity” template and naming your activity “RangingActivity”. This method gets called about once per second with a list of all beacons that are visible. The method loops through this list of beacons and checks to see if any of them are Eddystone-UID frames. You can tell if a beacon is an Eddystone beacon because it will have a serviceUuid of 0xfeaa, and a beaconTypeCode of x00. (For the Eddystone-TLM frame, the beaconTypeCode will be 0x20 and for Eddystone-URL the beaconType code will be 0x10). If it is an Eddystone-UID frame, we access the two identifiers (the namespace identifier and the instance identifier) as well as the estimated distance and log them with the Log.d statement above. To try this out, turn off your beacon that supports Eddystone and launch the app. Turn on the beacon, and watch the app react! If you don’t want to type everything in from above, you can download a working copy of the source code for this example app here. Obviously, this is a very simple app, but it demonstrates the basics of working with Eddystone. More complex apps that support Eddystone may be built that react differently based on the presence of different beacons, and react with data coming from cloud-based servers. You can even make the apps perform special functions depending on how far you are away from the beacon—one meter, ten meters or more. While this example just focuses on how to work with the main Eddystone-UID frame, you can see other coding examples of using the Eddystone-TLM and Eddystone-URL frames in the documentation for the Android Beacon Library.